Konoba Ribar. Some people like to buy souvenirs on their holidays. Others like to get to know a culture by visiting museums and studying the local history and culture. Some of us like to get to intimate with the local cuisine. Whether it’s creole parrot fish in the Seychelles, dim sum in Singapore or all the kinds of wurst in Germany – I’m the type of person who loves to get stuck into the local food. If you know exactly what I’m talking about, Konoba Ribar is the place for you. It doesn’t get more authentic than Ribar. This little restaurant which literally sits right on the waterfront is a seafood-lover’s dream. Their menu is relatively short and what’s on offer depends on what they caught that day. And when I say ‘they caught’, I mean literally what the owner went out and speared in the sea in front of the restaurant that day. 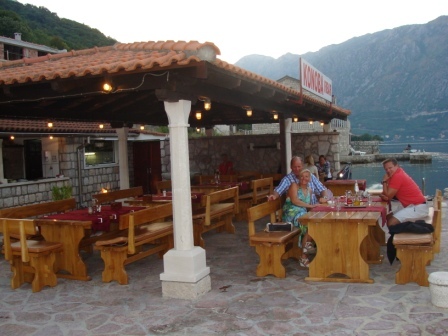 Ribar is on the waterfront in the tiny Bay of Kotor hamlet of Kostanjica, about a 20 minute drive from Herceg Novi. The owner built most of the stone restaurant himself by hand and until recently the restaurant was only open for private bookings. Now it’s open to the public and it’s the perfect place to get intimate with Montenegrin cuisine. The restaurant has a beautiful terrace right on the water that’s perfect for fine weather dining. They also have a cosy indoor area that’s ideal for the colder months. Even if you sit outside you’ll have to make a trip inside just to see the aquarium that takes up a whole wall and the well in the floor that holds an assortment of (unfortunate) live seafood like lobsters and shellfish. If you’re visiting between April and October and sitting out on the terrace you’ll likely be treated to the sight of a huge cruise ship leaving the bay. These are all lit up at night and are so impressive when seen up close. 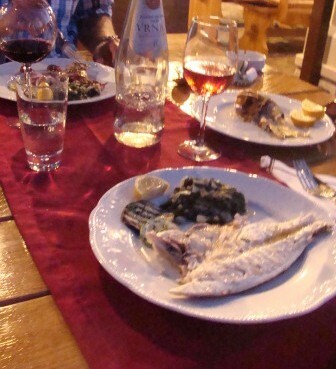 As I said, the menu is authentic Montenegrin seafood. What is that exactly you ask? 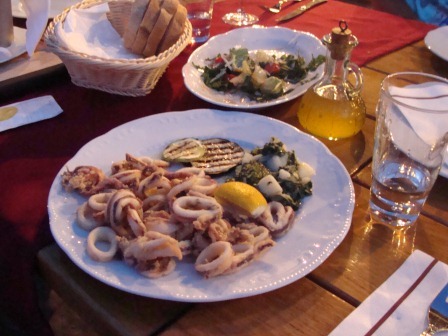 Think whole fish and calamari on the grill, octopus salad, black risotto, mussels in red and white sauces, salads made of local Mediterranean vegetables like juicy tomatoes and capsicum topped with feta cheese. And of course everything comes with a generous coating of parsley, garlic and olive oil. Feeling adventurous? Don’t hesitate to ask the own what the fish of the day is and his recommendation! If you plan to sit on seaside terrace, bring a cardigan or shawl for the evening as it can get quite cool even in summer. Address: Kostanjica bb, Kotor, Montenegro – just look for the Ribar sign, you can’t miss it. 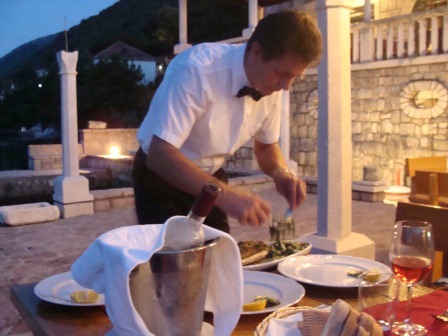 Want to write your own review of any restaurant in Montenegro? Click here.